Photo Credit: Lucas Oil Modifieds. CORONA, California (September 24, 2014) – Five weeks ago, when Vanessa Robinson and her family left Southern California for their home in Las Cruces, New Mexico, they were hurt and angry and ready to say to heck with racing. 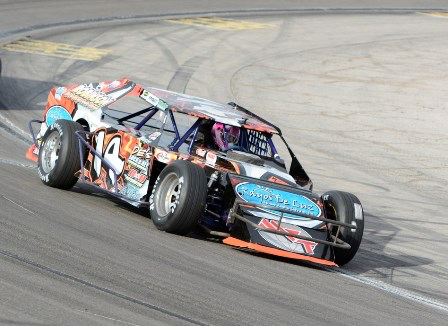 They had made the trip to Irwindale, California, for another race in the Lucas Oil Modified Series and were excited about racing on the fast half-mile oval for the first time. But two nights before the race thieves drove into the parking lot of their motel and drove out with the Robinson’s truck and trailer, a brand-new race car, a spare motor, all of Vanessa’s driving gear and all of their tools and equipment. Saturday night (September 27), when the Modifieds assemble at Lucas Oil I-10 Speedway in Blythe, California, for the Next Era Energy 100 presented by Sunoco Fuel, Vanessa Robinson will be there to try to earn a spot in the 24-car field. Nothing that was stolen has been recovered, Robinson said. But when the racing community heard about the theft her telephone started ringing with people offering cars and motors and tools and anything else that was needed, and when they got home they had a family discussion. The Robinsons didn’t have to start completely from scratch. The stolen car was a new one that never had been raced, but the old car was home in Martin Robinson’s garage, along with an older motor and a 48-foot trailer that needed some repairs. They have had to buy a new carburetor, some tires and wheels, tools and other items. “We weren’t going to give up,” Luz said. “We’ll make do with what we have and we feel good about it. We’ve been able to find enough stuff to put the car together and we’ll just keep racing. The Next Era Energy 100 is the eighth of 10 races on this year’s schedule and Cappello will go into it as the championship points leader thanks to his first career win at Irwindale while former leader Austin Barnes was sitting out a one-race suspension. Cappello, who had been second three times in a row before getting into victory lane, has a 28-point lead over Barnes, the 2012 champion, and is 40 points ahead of Larry Gerchman. Tripp Gaylord, Cappello’s teammate, and Chase Catania trail by 42 and 46 points, respectively. Barnes won the season’s first race at Blythe, April 19, with Jairo Avila Jr., Jason Patison, Gerchman and Cappello rounding out the top five. Last season two-time champion Jim Mardis and reigning champion Chris Gerchman were the winners of the tight quarter-mile oval. The speedway gates open at 5 p.m. and racing begins at 7 p.m. Tickets are $10 for adults, $8 for seniors (55 and over), military personnel and handicapped, $5 for teenagers 13 to 17 and $3 for children 6 through 12. Children 5 and under are free. There also is a Family Pack available (2 adults and 2 teens or children) for $20. -Lucas Oil Modifieds Press Release. Photo Credit: Lucas Oil Modifieds.